Quickspin, a Swedish video slots developer that brings high-quality games for gamers, recently released its first 3D-redered video slot game titled Durian Dynamite. Durian Dynamite Slot is a 5 reel and 20 pay line fruit themed video slot game that comes with Durian Dynamite symbols that explode to reward players with Wilds as well as a Free Spins feature with a number of Wild extras. 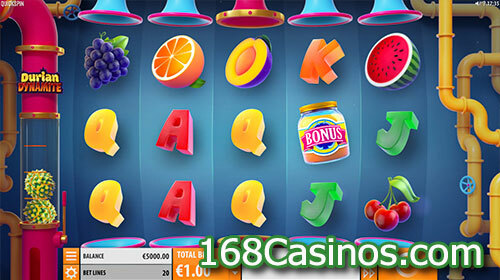 The new slot game is playable from 20p to £100 per spin across desktop, mobile as well as tablet devices. Symbols on the reels of the video slot include A, K, Q, J and 10 royals as well as oranges, plums, grapes, cherries and watermelons. The watermelon is the most rewarding symbol and players who land 5 across a pay line will be awarded with 25 times their stake. The durian is the Wild symbol that awards 2.5, 10 or 25 times a player’s stake for 3, 4 or 5 on a pay line respectively. The Wild symbol also substitutes for all symbols except the Scatter. The Dynamite Wild feature is triggered when a dynamite Wild symbol (which only appears on the Dynamite Reels) lands on the reels. Players get to shoot durian fruits onto the reels to explode Dynamite Wilds with the feature continuing until all durian fruits have been shot onto the reels. The Free Spins feature is triggered when 3 Bonus Scatters land on the reels with players taken to the Bonus Picker screen before they begin to get between 3 and 6 picks to uncover Free Spins, Duran Ammo and Dynamite Reels. Players could win up to 2,515.25 times their stake on each spin/free spin in the video slot.